While glass is a common material for greenhouses, polycarbonate has various merits that could help elevate it above glass as a good choice for your greenhouse. We stock twin-wall polycarbonate sheets that are each 4mm thick and available in a broad range of widths and lengths. See below various reasons to consider using our store to buy polycarbonate sheets for greenhouses. Polycarbonate has much in common with glass as a material that can help keep your greenhouse warm. In both instances, when solar radiation touches the greenhouse, it can pass through the sheets before being absorbed by the plants and ground inside. Both will convert this solar energy into heat energy, which will be incapable of escaping back through the sheets. This will help preserve the greenhouse's interior warmth, though it doesn't tell the whole story. Inside that greenhouse, there is also a process called convection, where warmer air rises and cooler air falls. However, as the air continues to be kept inside, it is also subject to convection and so continues to absorb further heat with every rise and fall. The sun produces three basic forms of light waves: visible light waves, infrared light waves, and ultraviolet - or UV - waves. Because waves of each type are relatively short in wavelength, they can easily pass through polycarbonate. It's a very different matter once those waves have been transformed into heat energy, or what is otherwise called thermal energy. The wavelength of thermal energy is much longer than that of light waves; as a result, the polycarbonate will prevent this energy escaping. You might be familiar with the term for this process: the Greenhouse Effect. It is not relevant only to greenhouses, as it also preserves the Earth's warmth and is responsible for your car's inside becoming hot when the weather is sunny. As we have already mentioned, polycarbonate and glass have particular benefits in common. However, polycarbonate can be a wiser choice of material if you are seeking to have greenhouse sheeting installed or replaced cost-effectively. It is not only cheaper than glass, but also lighter - thus making the sheeting easier to carry to the greenhouse site - and significantly stronger. This can make it safer because it is less likely to smash and so leave hazardous sharp edges. Glass, on the other hand, could be more easily broken due to harsh weather like hail or a ball from nearby playing children hitting the sheeting. 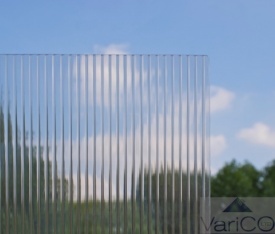 Whether you order just one polycarbonate sheet or a pack of polycarbonate sheets from our online store here at Varico, you can expect it to be delivered in only a few working days. Using our own vehicles, we can even personally deliver items to West Midlands areas including - but not limited to - Birmingham, Dudley and West Bromwich. More details are available when you call 01922 455338.